According to our research and to the best of our knowledge, in 1840 Maria was part of Hacienda Florida in Yauco's Barrio Barinas when Antonio Francisco Negroni Mattei acquired Florida from the Fernando Pacheco de Matos family. 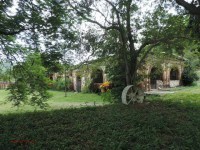 It is reasonable to believe that sometime between 1840 and 1843 he segregated part of Florida, which was then one of the largest Haciendas in Yauco, and sold it to Juan Maria Antongiorgi to raise capital to operate Florida. Per official records, on February 6, 1843 Juan Maria Antongiorgi received permission to use waters from the Duey and Yauco Rivers for irrigation of his Hacienda Maria. In 1852, Juan Maria ended up owning all of what originally was Hacienda Florida when he acquired Florida from Antonio Francisco who had run into financial difficulties due to the construction of an irrigation system. By 1885 Maria was an "Ingenio" with 700 "cuerdas", in 1896 Maria's ownership passed on by inheritance to Juan Maria's daughter Amelia Antongiorgi Paoli who was married to Juan Angel Franceschi Rodriguez. It was later acquired by their son Alejandro Franceschi Antongiorgi. 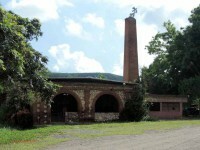 By 1902 the mill was no longer in operation and the sugarcane grown in the plantation was processed at the recently established Guanica Centrale . What used to be the owners house is now owned by the Claudio family who restored it and uses it as a site for weddings and other activities.